The Queen has ruled for longer than any other Monarch in British history, becoming a much loved and respected figure across the globe. Her extraordinary reign has seen her travel more widely than any other monarch, undertaking many historic overseas visits. Known for her sense of duty and her devotion to a life of service, she has been an important figurehead for the UK and the Commonwealth during times of enormous social change. Her Majesty continues to carry out a full programme of engagements, from visits to charities and schools, to hosting visiting Heads of State, to leading the nation in Remembrance and celebratory events - all supported by other members of the Royal Family. The Queen sees public and voluntary service as one of the most important elements of her work. The Queen has links - as Royal Patron or President - with over 600 charities, military associations, professional bodies and public service organisations. These vary from well-established international charities to smaller bodies working in a specialist area or on a local basis only. Her patronages and charities cover a wide range of issues, from opportunities for young people, to the preservation of wildlife and the environment. Having Her Majesty as Royal patron or president provides vital publicity for the work of these organisations, and allows their enormous achievements and contributions to society to be recognised. Her Majesty supports and encourages achievement in all walks of life through the annual programme of Investitures (at which she presents members of the general public with their honours), Garden Parties, receptions and other awards given in her name, which allow her to say ‘thank you’ to all those who have contributed to the life of the nation and the Commonwealth. The Queen carries out all of her duties against the backdrop of a full personal life which has seen her raise four children and welcome grandchildren, and now great-grandchildren to the Royal Family. The Duke of Edinburgh has been – in her own words – her ‘strength and stay’ during her reign, whilst other members of the Royal Family continue to offer vital support through their work in the UK and overseas. Today we are marking an inspiring milestone in The Queen's service to the UK and the Commonwealth #longestreign The Duke of Cambridge recently said 'I am privileged to have The Queen as a model for a life of service to the public...all of us who will inherit the legacy of my grandmother's reign and generation need to do all we can to celebrate and learn from her story"
In this section we look at Her Majesty’s extraordinary life and reign: from a young girl who did not expect to be Queen, to an iconic and celebrated figure who has ruled for more than 60 years. When she was born in Mayfair in 1926, Princess Elizabeth (now The Queen) and her family did not expect that she would one day become Monarch. Her Royal Highness was expected to live a relatively normal, if privileged, life with her close-knit and loving family. But everything changed in December 1936 when her uncle – King Edward VIII - abdicated, leaving her father as King, and her as next in line to the throne. The Queen was born at 2.40am on 21 April 1926 at 17 Bruton Street in Mayfair, London. She was the first child of The Duke and Duchess of York - who later became King George VI - and Queen Elizabeth. She was christened Elizabeth Alexandra Mary at Buckingham Palace on 29 May that year. At the time she stood third in the line of succession to the throne after Edward, Prince of Wales (later King Edward VIII), and her father, The Duke of York. The Princess was christened Elizabeth Alexandra Mary in the private chapel at Buckingham Palace. She was named after her mother, while her two middle names are those of her paternal great-grandmother, Queen Alexandra, and paternal grandmother, Queen Mary. The Princess's early years were spent at 145 Piccadilly, the London house taken by her parents shortly after her birth, and at White Lodge in Richmond Park. She also spent time at the country homes of her paternal grandparents, King George V and Queen Mary, and her mother's parents, the Earl and Countess of Strathmore. In 1930, Princess Elizabeth gained a sister, with the birth of Princess Margaret Rose. The family of four was very close. When she was six years old, her parents took over Royal Lodge in Windsor Great Park as their own country home. In the grounds of Royal Lodge Princess Elizabeth had her own small house, Y Bwthyn Bach (the Little Cottage), which was given to her by the people of Wales in 1932. Princess Elizabeth's quiet family life came to an end in 1936, when her grandfather, King George V, died. His eldest son came to the throne as King Edward VIII, but, before the end of the year, King Edward VIII had decided to give up the throne in order to marry the woman he loved, Mrs Wallis Simpson. Upon his abdication, Princess Elizabeth's father acceded to the throne as King George VI, and in 1937 the two Princesses attended their parents' Coronation in Westminster Abbey. Princess Elizabeth was now first in line to the throne, and a figure of even more intense public interest. In 1940, at the height of the Blitz, the young Princesses were moved for their safety to Windsor Castle, where they spent most of the war years. It was a time of austerity and anxiety for the whole country, including the Royal Family. But at Christmas time there was a period of light relief when the young Princesses put on pantomimes with the children of members of staff for the enjoyment of her family and employees of the Royal Household. Princess Elizabeth and Princess Margaret were educated at home like many girls from wealthy families at that time. After her father succeeded to the throne in 1936 and Princess Elizabeth became heir presumptive (first in line to the throne), she started to study constitutional history and law as preparation for her future role. She received tuition from her father, as well as sessions with Henry Marten, the Vice-Provost of Eton. She was also instructed in religion by the Archbishop of Canterbury. Princess Elizabeth also learned French from a number of French and Belgian governesses. It is a skill which has stood The Queen in good stead, as she often has cause to use it when speaking to ambassadors and heads of state from French-speaking countries, and when visiting French-speaking areas of Canada. Princess Elizabeth also studied art and music, learned to ride, and became a strong swimmer. She won the Children's Challenge Shield at London's Bath Club when she was thirteen. Princess Elizabeth enrolled as a Girl Guide when she was eleven, and later became a Sea Ranger. The Queen and The Duke of Edinburgh's enduring marriage has seen them support each other through many years of Royal duties, and has produced four children, eight grandchildren and six great-grandchildren. Though the early years of their marriage saw them living a relatively normal life as a naval officer and wife, The Queen's Accession changed everything as Her Majesty took on her new role, and The Duke of Edinburgh a new status in support of her work. Princess Elizabeth and Prince Philip first met when they attended the wedding of Prince Philip's cousin, Princess Marina of Greece to The Duke of Kent, who was an uncle of Princess Elizabeth, in 1934. Their engagement was announced on 9 July 1947 and the couple were married in Westminster Abbey on 20 November 1947. The event was fairly simple, as Britain was still recovering from the war, and Princess Elizabeth had to collect clothing coupons for her dress, like any other young bride. They spent their honeymoon at Broadlands, Hampshire, the home of Lord Mountbatten, and at Birkhall, Balmoral. 'I was so proud of you & thrilled at having you so close to me on our long walk in Westminster Abbey, but when I handed your hand to the Archbishop I felt that I had lost something very precious. Prince Charles, now The Prince of Wales, heir apparent to the throne, was born in 1948, and his sister, Princess Anne, now The Princess Royal, two years later. For #WorldPhotographyDay 📷 we wanted to share one of our favourite photographs with you. Here's The Queen with Prince Charles and Princess Anne in 1954, photographed by Marcus Adams. Princess Elizabeth and Prince Philip lived in Malta between 1949 and 1951, where Prince Philip was an officer in the Mediterranean Fleet. After Princess Elizabeth became Queen, their third child, Prince Andrew, arrived in 1960 and the fourth, Prince Edward, in 1964. Prince Andrew and Prince Edward were the first children to be born to a reigning monarch since Queen Victoria had her family. The Queen and The Duke of Edinburgh's grandchildren are Peter and Zara Phillips (b. 1977 and 1981); Prince William of Wales and Prince Henry of Wales (b. 1982 and 1984); Princess Beatrice of York and Princess Eugenie of York (b. 1988 and 1990); and The Lady Louise Windsor and Viscount Severn (b.2003 and 2007). Their great grandchildren are Savannah Phillips (b. 2010) and Isla Phillips (b. 2012), children of Peter and Autumn Phillips; Prince George (b. 2013), Princess Charlotte (b. 2015), and Prince Louis (b. 2018) children of The Duke and Duchess of Cambridge, and Mia Tindall (b. 2014), daughter of Zara and Mike Tindall. In 2007 The Queen and The Duke of Edinburgh became the first couple in the Royal Family to celebrate their Diamond Wedding anniversary (60 years). Family life has remained an essential support to The Queen and The Duke of Edinburgh. The family usually spends Christmas together at Sandringham in Norfolk, attending church on Christmas Day. 'I take this opportunity to mention the strength I draw from my own family. The Duke of Edinburgh has made an invaluable contribution to my life over these past fifty years, as he has to so many charities and organisations with which he has been involved. The Duke of Edinburgh has been a devoted companion or 'Consort' to The Queen in her official duties since she acceded the throne in 1952. In September of that year, shortly after her Accession to the throne, Her Majesty granted him precedence next to herself; and on 22 February 1957 she created him a Prince of the United Kingdom so that his title was from then on His Royal Highness The Prince Philip, Duke of Edinburgh. The Queen and The Duke of Edinburgh at Horse Guards for the #MexStateVisit ceremonial arrival. Photo copyright of Press Association. In 1953 The Duke of Edinburgh became the first peer to ‘do homage’ or pay his respects to The Queen at her Coronation, immediately after the Archbishops and Bishops. From 1967 he sat on a consort’s throne placed next to that of The Queen at the State Opening of Parliament. In 2009 The Duke of Edinburgh became the longest serving British consort, a distinction previously held by Queen Charlotte, George III’s consort. On 6 February 1952, King George VI died following a prolonged illness. Princess Elizabeth immediately acceded to the throne, becoming Queen Elizabeth II and taking on all of the responsibilities which came with her new title. Later in the year, the date was set for the Coronation at Westminster Abbey and preparations began for the spectacular ceremony. In 1952, King George VI's health was poor, and illness forced him to abandon a proposed Commonwealth tour. Princess Elizabeth, accompanied by Prince Philip, took his place. On Wednesday 6 February 1952, she received the news of her father's death and her own Accession to the throne while staying in a remote part of Kenya. In an instant, she had ceased to be Princess Elizabeth and was now Queen Elizabeth II. Following the news, the tour was abandoned, and the young Princess flew back to Britain as Queen. She was greeted by Prime Minister Winston Churchill and other officials at the airport before returning to Clarence House, where the Royal Standard was flown for the first time in her reign. The Coronation took place in Westminster Abbey on 2 June 1953. It was a solemn ceremony conducted by Dr Geoffrey Fisher, Archbishop of Canterbury. The Imperial State Crown, which will be worn by The Queen during today's #StateOpening of Parliament, at #BuckinghamPalace. The Imperial State Crown was originally made for Queen Victoria's coronation in 1838. It incorporates many gemstones, including the diamond known as the Second Star of Africa, the Black Prince's Ruby, the Stuart Sapphire, St Edward's Sapphire and Queen Elizabeth's Pearls. Representatives of the peers, the Commons and all the great public interests in Britain, the Prime Ministers and leading citizens of the other Commonwealth countries, and representatives of foreign states were present. Crowds of people viewed the procession all along the route, despite heavy rain. The ceremony was also broadcast on radio around the world and, at The Queen's request, on television for the first time. Television brought home to hundreds of thousands of people around the Commonwealth the splendour and significance of the Coronation in a way never before possible. The Coronation was followed by drives through every part of London, a review of the fleet at Spithead, and visits to Scotland, Northern Ireland and Wales. The Queen’s reign has been punctuated by an unprecedented series of milestones. Her Majesty’s jubilees and birthdays have provided cause for celebration and reflection throughout the remarkable years since her Accession. Such events help reinforce the Sovereign's role as a focus for national identity and unity as people across the Commonwealth come together to mark an important occasion for their Head of State. In 1977 The Queen's Silver Jubilee was marked with celebrations throughout the UK and Commonwealth. The actual anniversary of The Queen's Accession on 6 February 1952 was commemorated in church services throughout that month. The Queen spent the anniversary weekend at Windsor with her family and the full jubilee celebrations began in the summer of 1977. On 4 May, at the Palace of Westminster, both Houses of Parliament presented loyal addresses to The Queen, who in her reply stressed that the keynote of the jubilee was to be the unity of the nation. During the summer months The Queen embarked on a large scale tour, having decided that she wished to mark her jubilee by meeting as many of her people as possible. No other Sovereign had visited so much of Britain in the course of just three months - the six jubilee tours in the UK and Northern Ireland covered 36 counties. The home tours began in Glasgow on 17 May, with greater crowds than the city had ever seen before. The tours continued throughout England and Wales - in Lancashire over a million people turned out on one day - before culminating in a visit to Northern Ireland. Official overseas visits were also made to Western Samoa, Australia, New Zealand, Tonga, Fiji, Tasmania, Papua New Guinea, Canada and the West Indies. During the year it was estimated that The Queen and The Duke of Edinburgh travelled 56,000 miles. The climax of the national celebrations came in early June. On the evening of Monday 6 June, The Queen lit a bonfire beacon at Windsor which started a chain of beacons across the country. 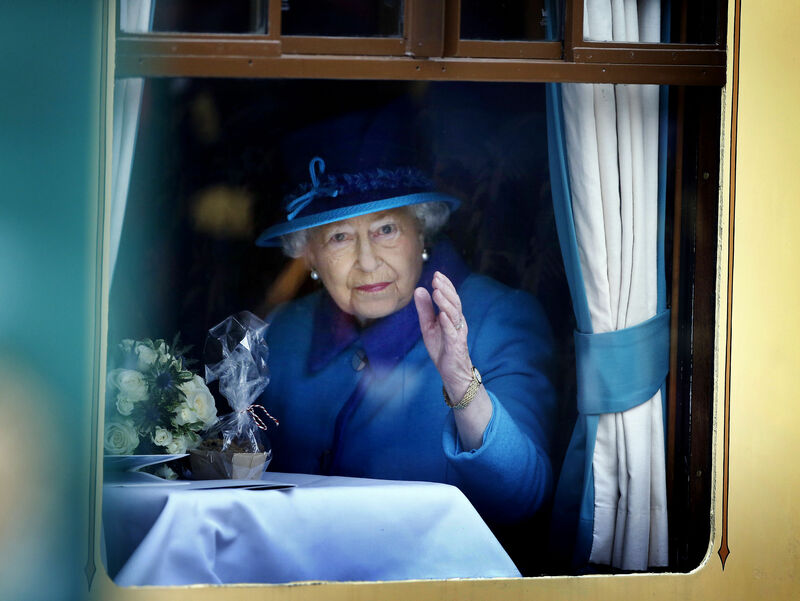 On Tuesday 7 June, vast crowds saw The Queen drive in the Gold State Coach to St Paul's Cathedral for a Service of Thanksgiving attended by heads of state from around the world and former prime ministers of the UK. An estimated 500 million people watched on television as the procession returned down the Mall. Back at Buckingham Palace The Queen made several balcony appearances. Street parties and village parties started up all over the country: in London alone 4,000 were reported to have been held. The final event of the central week of celebrations was a river progress down the Thames from Greenwich to Lambeth on Thursday 9 June, emulating the ceremonial barge trips of Elizabeth I. After The Queen had opened the Silver Jubilee Walkway and the new South Bank Jubilee Gardens, the journey ended with a firework display, and a procession of lighted carriages took The Queen back to Buckingham Palace for more balcony appearances to a cheering crowd. A packed programme of events took place in 2002 to celebrate fifty years of The Queen's reign. Six key Jubilee themes shaped events: Celebration, Community, Service, Past and future, Giving thanks and Commonwealth. The Queen and The Duke of Edinburgh undertook extensive tours of the Commonwealth and the UK, leading to an extraordinarily busy year for the royal couple. Her Majesty and His Royal Highness visited Jamaica, New Zealand, Australia and Canada as well as every region of the UK, from Falmouth in Cornwall to the Isle of Skye. The royal couple attended a dinner hosted by the Prime Minister at No 10 Downing Street and a session of the Joint Houses of Houses Parliament in Westminster Hall at which Her Majesty addressed both Houses. They also gave a dinner for representatives of the Armed Services at Windsor Castle and visited the Armed Forces in Portsmouth. The central focus for the year was the Jubilee weekend in June 2002 which began with a classical music concert in the gardens at Buckingham Palace. There was a Jubilee Church Service at St George's Chapel in Windsor and a National Service of Thanksgiving at St Paul's Cathedral which followed a Ceremonial Procession from Buckingham Palace. Events culminated in a pop concert at Buckingham Palace with performers including Paul McCartney, Bryan Adams, Elton John and Shirley Bassey. The evening ended with a spectacular fireworks display and The Queen lighting the National Beacon, the last in a string of 2,006 beacons which had been lit in a chain across the Commonwealth. ‘I would like to give my heartfelt thanks to each and every one of you - here in Guildhall, those of you waiting in the Mall and the streets of London, and all those up and down this country and throughout the Commonwealth, who may be watching this on television. Thank you all for your enthusiasm to mark and celebrate these past fifty years. The Queen turned 80 on 21 April 2006 and celebrated her official birthday on 17 June 2006. A number of events took place to celebrate the birthday, both around Her Majesty's actual birthday on 21 April and her official birthday on 17 June. A unique Children's Party at the Palace was held at Buckingham Palace to celebrate the magic of books. 2,000 children were invited, and a stage performance – during which The Queen made a camero appearance – was broadcast live on the BBC. Trooping the Colour marked Her Majesty’s official birthday as it does every year, but to mark the special occasion, a spectacular flypast and a 'feu de joie' (fire of joy) were added to the traditional celebrations. Services of Thanksgiving were held at St George’s Chapel in Windsor and at St Paul's Cathedral, and the latter was followed by a lunch at Mansion House in London. The Queen celebrated with others of her generation who had similarly led a life of service and dedication at a 'Service over sixty' reception hosted by Her Majesty, which celebrated guests over the age of sixty who have made a significant contribution to national life, as did the Help the Aged Living Legends Awards at Windsor Castle. And on 19 April, guests celebrating their 80th birthdays on the same day as her were invited to Buckingham Palace. The Queen spent her actual birthday meeting the crowds on a walkabout in Windsor before attending a private family dinner at the newly restored Kew Palace, followed by a spectacular fireworks display. Her Majesty received almost 40,000 birthday messages from members of the public during her 80th birthday year. The Queen and The Duke of Edinburgh celebrated their 60th wedding anniversary on 20 November 2007. Events to mark the low-key anniversary included a Service of Celebration at Westminster Abbey followed by the unveiling of a new Jubilee Walkway panoramic panel in Parliament Square. The couple also returned to the location of their honeymoon: Broadlands in Hampshire, home of Prince Philip’s uncle, Earl Mountbatten, to recreate the photographs which had been taken 60 years previously. The Diamond Jubilee was marked with a spectacular central weekend and a series of regional tours throughout the UK and Commonwealth. The Queen and The Duke of Edinburgh travelled as widely as possible across England, Scotland, Wales and Northern Ireland, visiting every region during 2012 whilst other members of the Royal family visited all of the Commonwealth realms between them (countries where The Queen is Head of State). Visits included The Prince of Wales and The Duchess of Cornwall in Australia, Canada, New Zealand and Papua New Guinea and The Duke and Duchess of Cambridge in Tuvalu. The central weekend began with The Queen’s visit to the Epsom Derby on the Saturday. On the Sunday, ‘Big Jubilee Lunches’ were held across the UK: building on the already popular ‘Big Lunch’ initiative, people were encouraged to share lunch with neighbours and friends as part of the Diamond Jubilee celebrations. The Thames Diamond Jubilee Pageant also took place on the Sunday, with up to 1,000 boats assembled on the Thames from across the UK, the Commonwealth and around the world. The Queen and The Duke of Edinburgh travelled in the Royal Barge which formed the centrepiece of the flotilla. On the Monday, a host of famous faces came together to celebrate the Diamond Jubilee against the backdrop of Buckingham Palace for a concert organised by Take That singer and songwriter Gary Barlow for the BBC. Performers included Will.i.am, Stevie Wonder, Grace Jones and Kylie Minogue. Following the concert, The Queen lit the National Beacon: one of a network of 2,012 Beacons which were lit by communities and individuals throughout the UK, Channel Islands, the Isle of Man and the Commonwealth. The Diamond Jubilee weekend culminated with a day of celebrations in central London, including a service at St Paul’s Cathedral followed by two receptions, a lunch at Westminster Hall, a Carriage Procession to Buckingham Palace and finally a Balcony appearance, Flypast, and Feu de Joie. The Queen's Diamond Jubilee Trust was set up to take donations from those wishing to present a gift to Her Majesty in her Diamond Jubilee year. The funds raised have gone towards initiatives such as Queen's Young Leaders, which supports young people across the Commonwealth who are blazing a trail in their communities. On 9th September 2015 The Queen became Britain's Longest Reigning Monarch. Prince Philip and I are very grateful for the warmth of your welcome on this occasion. Many including you, First Minister, have also kindly noted another significance attaching to today, although it is not one to which I have ever aspired. Inevitably, a long life can pass by many milestones; my own is no exception. But I thank you all, and the many others at home and overseas, for your touching messages of great kindness. The Queen celebrated her 90th birthday on 21 April 2016 and her official birthday on 11 June 2016, the second day of three days of national celebrations. Her Majesty's actual birthday was spent in Windsor where she meet well-wishers during a walkabout in the town centre and met others celebrating their 90th birthdays, before unveiling a plaque marking The Queen's Walkway. Later in the evening, Her Majesty, with The Prince of Wales, lit the principal beacon which set in train a series of over 900 beacons across the country and worldwide to celebrate her momentous milestone. On June 10 2016 The Queen and The Duke of Edinburgh were joined by members of the Royal Family of a National Service of Thanksgiving at St Paul's Cathedral. Prayers at the service were led by people representing aspects of Her Majesty's life and role. Sir David Attenborough read Paddington Bear creator Michael Bond's personal account of growing up to be 90. June 12 2016 saw a huge street party and parade take place on the Mall - The Patron's Lunch - a celebration of over 600 charities and organisations that The Queen was Patron of. The Duke of Cambridge paid tribute to his 'Granny', speaking of Her Majesty's strong health, relentless energy, her sharp wit and for being at the helm of her family, nation and Commonwealth. 6 February 2017 marked 65 years since The Queen acceded to the throne, becoming the first British Monarch to mark their Sapphire Jubilee. 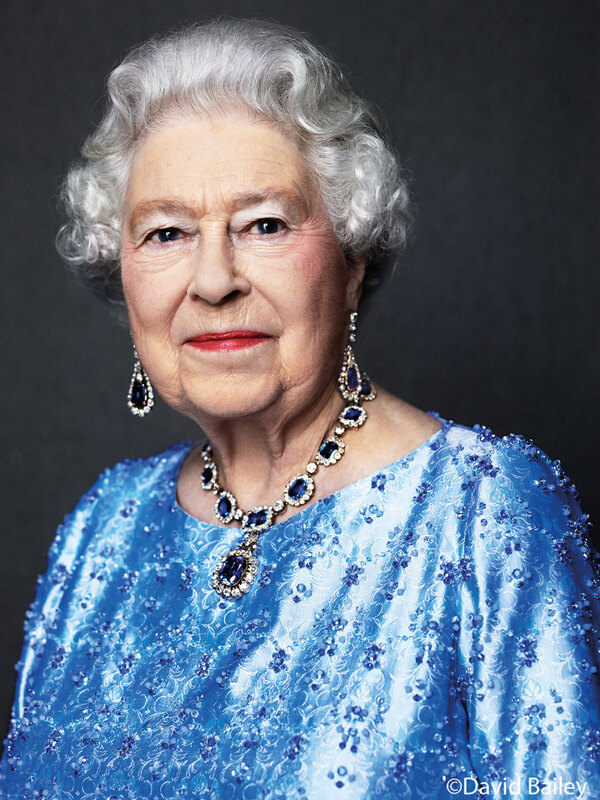 To coincide with the occasion Buckingham Palace re-released a photograph of Her Majesty taken by David Bailey in 2014. In the photograph, The Queen is wearing a suite of sapphire jewellery given to her by King George VI as a wedding gift in 1947. As is usual on Accession Day, Her Majesty spent the day privately at Sandringham. The Queen takes a keen and highly knowledgeable interest in horses. She annually attends the Derby at Epsom, one of the classic flat races in Britain, and the Summer Race Meeting at Ascot, which has been a Royal occasion since 1911. As an owner and breeder of thoroughbreds, Her Majesty often visits other race meetings to watch her horses run, and also frequently attends equestrian events. The Queen's horses have won races at Royal Ascot on a number of occasions. There was a notable double on 18 June 1954 when Landau won the Rous Memorial Stakes and a stallion called Aureole won the Hardwicke Stakes, and in 1957 The Queen had four winners during Ascot week. The Queen also enjoys walking in the countryside and spending time with her dogs. For her eighteenth birthday, The Queen was given a Corgi named Susan from whom numerous successive dogs were bred. Some Corgis were mated with dachsunds (most notably Pipkin, who belonged to Princess Margaret) to create ‘Dorgis’, and Her Majesty has owned Corgis and Dorgis ever since. A lesser known interest is Scottish country dancing. Each year during her stay at Balmoral Castle, The Queen gives dances known as Gillies' Balls, for neighbours, estate and Castle staff and members of the local community. Historic mercantile centre of London, covering one square mile. London-based members' club for serving, former and retired civil servants. Charity making grants to help Anglican clergy and their families in times of need. Yacht club in Lisbon, Portugal. Organisation promoting peace and reconciliation on the island of Ireland by practical measures. The oldest regular regiment in continuous service in the British Army. MOD-sponsored organisation providing Armed Services-type personal development in schools. Association for Australian sales people. Promotes the continuing development of a friendly, world-class Commonwealth Games. Brings together judicial officers from throughout the Commonwealth to share knowledge and practices. My hope this Christmas is that the Christian spirit of reconciliation may burn as strongly in our hearts during the coming year. In the United Kingdom we have our own particular sorrows in Northern Ireland and I want to send a special message of sympathy to all those men, women and children who have suffered and endured so much. My message today is one of encouragement and hope. Then Christmas comes, and once again we are reminded that people matter, and it is our relationship with one another that is most important. The true celebration of diversity involves reaching out, recognising and embracing difference, and in so doing enriching our lives. We celebrate the ties between our two countries and prepare to take them to ambitious new heights. Inevitably, a long life can pass by many milestones; my own is no exception. But I thank you all, and the many others at home and overseas, for your touching messages of great kindness. Since 1945 the United Kingdom has determined to number among Germany's very strongest friends in Europe. In the century since the first W.I. groups were formed in North Wales and in Sussex, so much has changed for women in our society. One simple lesson from history is that when people come together to talk, to exchange ideas and to develop common goals, wonderful things can happen. When the dynamism and creativity of our two countries are combined, whether that be in business, science, education, sport or culture, the results are extraordinary. No hundredth birthday greeting will give greater pleasure to deliver than the one I give to you, along with these New Colours today. For every poppy a life; and a reminder of the grief of loved ones left behind.